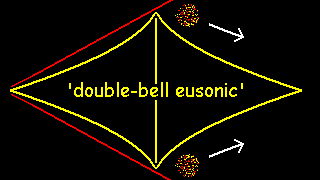 The air flow over a standard wing-section compresses at the leading edge, accelerates over the hump, drawing surrounding air with it, and draws-down with suction aftward pulling the larger air-mass with it (similarly as an 'exponential' audio-speaker-horn transforms high-velocity low mass, to high-mass, low velocity). It is energy-efficient, requiring only a gentle glide slope to maintain velocity. A helicopter down-peller also is winglike, not as fast-moving as the exhaust of a jet engine or the backwash of a plane propeller at takeoff (albeit not by much, as its advantage is mostly the WIG wing-in-ground effect and lower velocity),- and spreading more and moving less, and actually recovering somewhat back up for the blade next-around in flocklike rhythm. 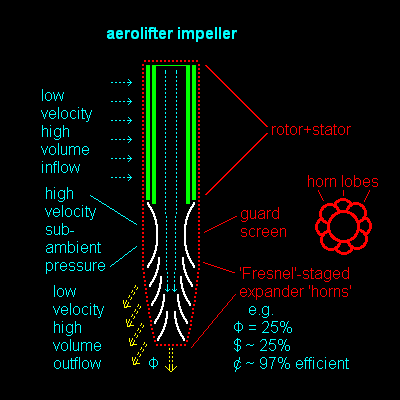 By placing a compact radial-to-centrifugal fan-jet engine air-driver compeller exhausting at top-center over a round expansion section, its outflow sweeps air mass off the broad curved top while sucking a laminar flow hugging around the wing-hunch-like edge and inward behind, drawing-down additional air mass, and providing lift. 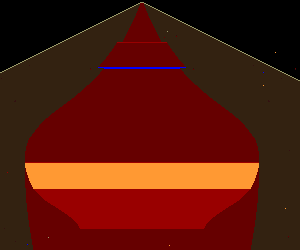 The air mass collecting underneath the concave base (not diagrammed), slows and increases lift pressure .... 3D expansion below the air-driver is faster-steeper than expansion over a wing-section, and may be more efficient. 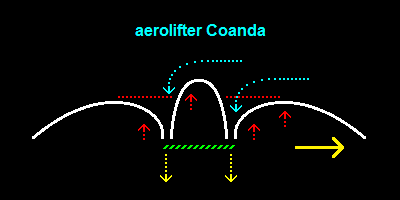 Furthermore, By placing an air-heater at the girth while maintaining laminar flow, air drawn back-under is reduced while aft pressure increases yielding upward thrust. 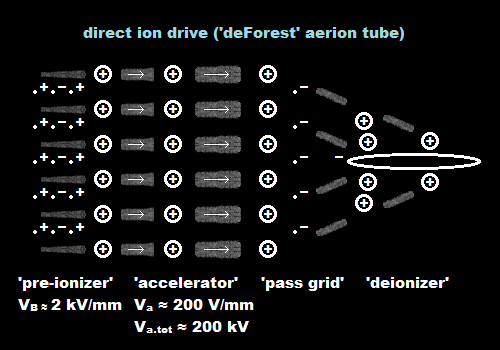 The heater can be external nuclear or nuclear-powered electric;- which for the purpose of a shuttle without a nuclear reactor, Be-10, Ca-48, or Zr-96, may be efficient, safe nuclear fuels, fissioning in a controlled-loop beta-chain reaction shielded for moderately high sub-to-mega-voltage (electrons, no neutrons; and the base metal is stable in heated atmosphere). 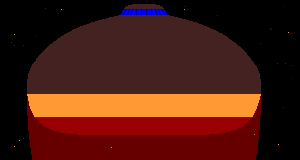 At supersonic speeds the leading cone becomes a mach-punch slowing the air. 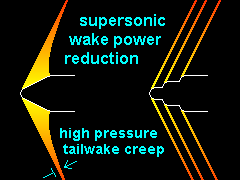 An early concept utilizing an inverted leading-nozzle 'bell' to slow on-taken air, and its hypersonic after-shock(wave)wall as its inward-focusing outer pressure-wall to an 'aerospike' nozzle (in-out-reflected-aerospike may need a transsonic capture-deflector ring at its perimeter). 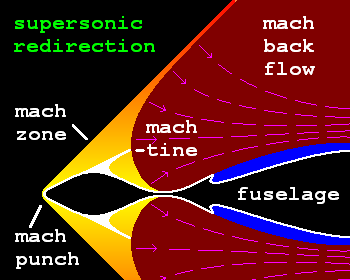 A first-concept 'redirector' for supersonic air from the mach cone, back-around over the fuselage.... Mach-tines extending back from the hump of the mach-punch maintain the mach zone behind, where it rebuilds and lets the backside deflect its backflow and pressure outward-- around, over a mach cavity over the fuselage, lowering mach flow 'drag' until it reconnects about the rear of the craft. This article was developed in part for a project Sesquatercet movie-story.